Vice Admiral Takijiro Ohnishi, who founded the Kamikaze Special Attack Corps in October 1944, selected the meaningful name of Kamikaze  for the unit designated to carry out aerial suicide attacks against Allied warships. All Japanese people knew the legend of the famous kamikaze, meaning "divine wind," which had destroyed Mongol invaders who attacked Japan in the late 13th century. Ohnishi hoped that kamikaze pilots would accomplish the same end as the historical kamikaze, namely, to destroy enemy ships and turn back the foreign invaders. 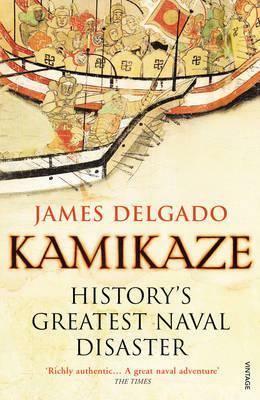 James Delgado, President of the Institute of National Archaeology and author or editor of 30 books, has written a fascinating narrative concerning known facts and uncertain legends related to the 13th century kamikaze. This paperback entitled Kamikaze: History's Greatest Naval Disaster contains extensive historical background for the two Mongol invasions of Japan in 1274 and 1281. The author often introduces historical events based on artifacts that have been discovered. The hardcover book published in 2009 by Bodley Head has the same contents but different title, Khubilai Khan's Lost Fleet: History's Greatest Naval Disaster. The book's origin comes from Delgado's archaeological dive in August 2002 at Takashima Island, where a powerful storm destroyed much of Khubilai Khan's navy in 1281. This trip became the basis for a 2003 one-hour TV episode entitled "The Lost Ships of Kublai Khan," which was hosted by Delgado for the series The Sea Hunters. The first Mongol invasion of Japan in 1274 does not get introduced until Chapter 7, about halfway through the book. The book's first half provides historical background to understand the two Mongol invasions of Japan. Chapters cover topics such as Asian mariners, Genghis Khan and the rise of the Mongols, his grandson Khubilai who became the first and greatest Mongol emperor of China, and the navy built by the Song Dynasty of southern China. Since this book was written for a general rather than an academic audience, this wide-ranging history helps readers unfamiliar with the topic to better understand the reasons and background of the Mongol invasions of Japan. The 1274 Mongol invasion gets covered rather briefly in Chapter 7. Khubilai Khan first sent envoys to Japan in 1268 with a demand of subservience to the Mongols, but this envoy and two subsequent ones sent to Japan were ignored by the country's leaders, acts that could be interpreted by the Mongols as a declaration of war. On October 3, 1274, an armada left the Korean peninsula and sailed toward the Japanese island of Kyushu with 6,700 sailors and 23,000 Mongol, Chinese, and Korean soldiers. After the armada quickly overwhelmed Japanese forces on Tsushima and Iki, two small islands in the Korea Strait, about six thousand Japanese soldiers (number estimated by modern Japanese historians) met the invading Mongol force at Hakata Bay when they arrived on October 19. The two armies clashed and then the Japanese forces waited for the next morning to continue fighting, but they found then that most Mongol ships had vanished. Historians do not know why the Mongol force left so quickly. One Japanese source wrote in 1274 that a reverse wind (typhoon?) caused the ships to return, but the reason could be as simple as the Mongol force decided to retreat when it realized that the Japanese defenders were too strong for the invading army to overpower easily. Chapter 8 tells the story of the 1281 Mongol invasion, although much remains uncertain such as the total number of ships and soldiers. After the unsuccessful 1274 Mongol invasion, Japan prepared for another invasion by constructing a Mongol Defense Wall in Hakata and by organizing a defense force. In both 1275 and 1279, the Japanese shogunate beheaded envoys from Khubilai Khan demanding surrender by Japan, so the next Mongol invasion in 1281 came as no surprise. Khubilai Khan planned to attack Japan with an overwhelming force of two fleets, one with 40 thousand troops from the Korean peninsula and another with 100 thousand troops from southern China made up in large part of the former Song Dynasty navy. The force from the Korean peninsula did not wait for the southern China force and arrived at Hakata in the middle of June 1281. The 3,500 ships in the Mongol force from southern China later reached Japan and landed about 30 miles south of Hakata. The Mongol forces and the Japanese army fought each other to a stalemate for nearly two months. On August 15 and 16, 1281, a typhoon destroyed nearly all of the Mongol fleet, which ended the attempted invasion. The next chapter presents an excellent analysis of the myths that sprang up around the kamikaze (divine wind) that destroyed the Mongol invaders. During Japan's long period of isolation between 1636 and 1854, most Japanese people had no knowledge of the Mongol invasions and the typhoon that destroyed the invaders in 1281, since the shogunate prohibited any mention of the events. This historical event was not common knowledge among the Japanese people until 1890, when long forgotten scrolls depicting the event reappeared. During the 1890s, the legend was resurrected and grew as more emphasis was placed on divine intervention against an overwhelming foreign invading force. Militarists from that time until the end of WWII used the kamikaze legend to emphasize that Japan was under divine protection. Vice Admiral Ohnishi also invoked this legend when he formed the Shinpu (another way to read the Chinese characters for Kamikaze) Special Attack Corps in the Philippines in October 1944 as the Japanese military sought an effective way to mount a defense against overwhelming Allied forces. It is analogous to reconstructing 4,000 different jigsaw puzzles with only one percent of the pieces remaining and no templates. Those pieces were put into a blender of sea and were mixed together. It is difficult to figure out which piece goes to which ship. Based on analysis of pieces of ships that have been recovered from the sea floor, Sasaki has evidence that the Mongol fleet that attacked in 1281 was constructed hastily with shoddy workmanship, which may have been a major reason why the ships did not survive the typhoon that hit the area. The last chapter (12) somewhat strays from the book's main topic as Delgado discusses subsequent Mongol naval invasions that failed in the areas of Vietnam and Java. The book's center contains 16 pages of black-and-white photographs, but the text does not directly refer to these in order to integrate them into the narrative. The author's thorough research is reflected in ten pages of sources and 20 pages of notes at the end. The front has four pages of maps, including ones showing the routes followed by the invading Mongol fleets in 1274 and 1281. Kamikaze: History's Greatest Naval Disaster, with its accessible language and style, not only tells what has been discovered about the 13th century Mongol invasions of Japan but also presents some of the challenges of marine archaeology. Much remains to be discovered as marine archaeologists continue to work to find pieces of Mongol ships and the artifacts they contained. 1. Actually, Vice Admiral Ohnishi chose the name of Shinpu for the new air unit that would use Zero fighters carrying 250-kg bombs to crash into enemy ships in the Philippines. Shinpu is an alternative reading of the two kanji (Chinese characters) normally read by Japanese people as kamikaze. Both readings have the same meaning of "divine wind."